If you overlook the title, "China's Economic Invasion of Africa," you'll enjoy a well-done and interesting story by Xan Rice in The Guardian's Sunday, February 6, 2011 issue. It contains great interviews of individual Chinese entrepreneurs and corporate managers who have come to do business or seek their fortunes in African countries. 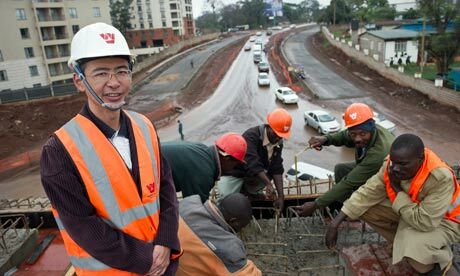 Here's one quotation from a Chinese entrepreneur who, Rice writes, "is aware that western attitudes to China's push into Africa remain largely negative – something he struggles to understand." Some of those funny tricks might involve practices that have been outlawed in the West under laws like the US Foreign Corrupt Practices Act and the OECD Convention on Corruption. These are not always observed by Western companies, but at least they serve as an important signal of a liberal normative consensus. China has no comparative law. It was particularly interesting to me that the story begins with Zhang Hao, the son of a man who worked on one of China's foreign aid-financed development projects -- a fishing project on Lake Victoria that I wrote about in The Dragon's Gift. After spending time there himself as an aid worker, Hao's father encouraged him to explore business opportunities in Uganda. A hat tip to Li Anshan's Centre for African Studies at Peking University. I think there is great promise in developing Africa's infrastructure, and China seems pretty happy to do it. What do you make of China's labor practices in Africa? I've heard mostly negative things, but haven't been there to see for myself. I tried writing a little about the basics of China's growing role in Africa and would be interested in having someone with more authority fact check it. Well, well, “locomotives” Tom is “Seeing Red” Tom! What a surprise! Nice to meet you here at "The Real Story" ! Very often I see some of your articles on my screen, so too some days ago 2 of your articles from your Good, Bad & Ugly series. The same was true for the article by Xan Rice in The Guardian. You can feel that those articles are honest and try to bring underexposed but real aspects of the China/Africa saga to the attention of a wider public. For me it is very tempting to respond, but I do not know if Deborah sees her blog as a platform on which a detailed discussion can take place? Still, one thought: I can easily write a “The Good, Bad & Ugly” series about Belgian colonialism in Congo. I think that you can imagine some subjets for the Bad and Ugly parts. The Good would then be about the administrative organization of the country,the infrastructure, the education, the healthcare Belgium left at the independance (1960). The whole of Africa was jealous on this and on the Congolese GDP that was equal to that of Canada and South Korea of that time. But as history has shown, everything was “Bad” because everything was built according to Belgian intrests. (It was De Gaulle who said: a nation has no friends, only intrests, and I am afraid that is an timeless & universal rule). Then came the neo-colonialist period and idem ditto, but this time the Congolese revenue was shared between Belgian, France and US intrests, and please do not forget Mubutu! If I see how China is structuring its win-win deals with U.S. companies I can assure you that they have nothing in common with the win / wins deals proposed in Africa. It is assumed that eg the oil reserves of Angola will be exhausted in 15 years. But how will Angola realise its own take off? In which economical branch (that is not already occupied by the West or China)? The nanno technology? Dan & Tom: Discussions welcome on my blog. I'll try to look at your posts on the Good, Bad & Ugly, Dan. On Chinese labor practices in Africa: they closely resemble Chinese labor practices in China, where labor rights and protections are not well developed. That said, it's not accurate to see all Chinese managers in Africa as standing by ready to shoot workers who dare to protest labor conditions. . . In the past, the Chinese people suffered a lot from poverty, epidemics, hunger and foreign aggressions and invasions to trample on the Chinese people's rights and dignity, and tear away large chunks of Chinese territory. After the founding of New China in 1949, the Chinese people stood up and under the wise leadership of such leaders as Mao Zedong, Deng Xiaoping etc., they worked very hard to extract their country out of underdevelopment. That's exactly what was said about first the German people's and then the Japanese people's astounding courage in front of their working conditions. I can only admire the Chinese workers' endeavours to work hard to make a living and lift their country off the poverty line. Now, if there are countries and peoples who think they are going to succeed without toil and self-imposed sacrifices, let them doze in peace and stop once for all bemoaning on their sad fate!!! I don’t necessarily endorse this thesis, but there is evidence for it. It may at the very least be one of those hidden or secondary motivations fueling the official decision making. And it makes sense of some of the concerns I had mentioned here. Another thing worth noting is that the US relationship with Israel is often critically cited as the driving force behind tensions with Iran. If the foregoing is accurate, however, this would appear to be just more misdirection, tapping into prejudices to inflame, divide and obscure. An alumnus from China like him can be appointed to take charge of a whole city’s network, which is a very important position that he could never dream of getting as a first appointment in China. In addition, the salary is higher. Ning is paid around £1,500 per month, while the same job in China would earn him only about a third of this. Most Chinese workers in Africa have similar reasons for pursuing these jobs. They are young and they want to gain experience as well as make some money.